We are pleased to announce the first Cannabis Professional roundtable discussion on April 26, 2019 at noon. This subscriber perk will bring together industry leaders with the editorial staff of Cannabis Professional at The Globe and Mail’s head office in Toronto. *Note: Space is limited, our staff will e-mail you directly with confirmation of your spot. Topic of discussion: Can Canada maintain its first-mover status as cannabis goes global? 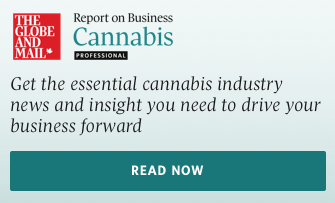 Featuring Cannabis Professional reporters Jameson Berkow, Mark Rendell, and editor Rob Gilroy. And: A tour of The Globe and Mail’s editorial office space at 351 King. Please send any questions to ROBCannabisPro@globeandmail.com. This is a new feature from Cannabis Pro. To let us know what you think, please email ROBCannabisPro@globeandmail.com.